Authors: Spotkai S.E., Lykhina L.Y. The popularity of the German Shepherd breed and its use in many areas of human life creates the need to search for new identification methods to establish ownership. The identification methods available, such as chipping and marking, have several disadvantages. The method of dogs’ identification by rhinarium’s imprint is comparatively cheap and reliable. Papillary patterns reflected on rhinarium’s imprint are relatively constant, and have common and particular signs of difference, which make it possible to distinguish the impression of one dog from another. Dogs of the same breed have a standardized exterior, that is, similarity in external characters, which suggests that there are similarities between common and particular characteristics within the same breed. It is found that imprints of the rhinarium of German shepherd breed dogs, obtained from dogs of different origin, housing and feeding conditions, have common features of papillary patterns peculiar to the given breed. The presented results of the comparison of skin patterns of the rhinarium show that this breed is characterized by a straight, straight round-pointed and V-shaped forms of the nose symmetry line, the majority of the representatives of the breed have prints heavily spotted with lines and, as a rule, have 2 branches of the line of symmetry, which proves the presence of breed characteristics and allows for the use of prints in forensic and forensic veterinary identification of dogs. biometric identification of dogs, rhinarium’s imprints, papillary patterns, form of nose’s symmetry line, German shepherd. Vascellari M, Mutinelli F, Cossettini R, Altinier E. Liposarcoma at the site of an implanted microchip in a dog. The Veterinary Journal. 2004; 168(2):188—190. Available from: doi: 10.1016/S1090-0233(03)00121-7. (In Russ). Willia J. Implanted Microchips Cause Cancer. Dogs naturally. Available from: http://www.dogsnaturallymagazine.com/implanted-microchips-cause-canser/ [Accessed 04th July 2018]. Albrecht K. Microchip-Inducted Tumors in Laboratory Rodents and Dogs: A Review of the Literature 1990—2006. In: 2010 IEEE International Symposium on Technology and Society, 7—9 June 2010,Wollongong, NSW, Australia. IEEE; 2010. p. 337—349. Available from: doi: 10.1109/ISTAS.2010.5514622. Budras KD, McCarthy PH, Horowitz A, Berg R. Pelvic Diaphragm, Ischiorectal Fossa; Associated Arteries, Veins and Nerves. In: Budras KD. (ed.) Anatomy of the Dog. 5th ed. Hannover, Germany: Schlütersche Verlagsgesellschaft mbH & Co. KG; 2007. p. 72—75. Aspinall V, Cappello M. Introduction into Veterinary Anatomy and Physiology. Textbook: 3rd ed. Edinburgh: Elsevier; 2015. Frewein J, Vollmerhaus B. Anatomie von Hund und Katze. Berlin: Blackwell-Wiss.-Verl; 1994. Khlamova ES. Application of phenetic analysis of traits in cynology. Herald of Russian state agrarian correspondence university. 2008; (4):107—109. (In Russ). Spotkai SE. Features of the skin patterns of the nasal mirror of labrador retrievers. 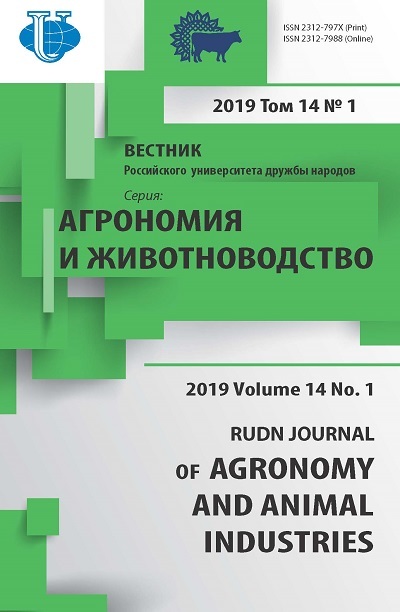 Bulletin of the Kyrgyz National Agrarian University n.a. K.I. Scriabin. 2017; (3):139—140. (In Russ). Kapilyushina TE. Encyclopedia of dog breeder. Novosibirsk: Evrika Publ. ; 1993. (In Russ). Mei G. All about the most popular breeds of dogs. Saint Petersburg: Kristall Publ. ; 2005. (In Russ). Spotkai SE, Arbaev KS, Lykhina LY. The method of determining the crest count index when investigating the nasal plane of dogs. Indexes of the crest count of different breeds of dogs. Veterinarija Kubani. 2018; (3):12—14. (In Russ). Copyright (c) 2019 Spotkai S.E., Lykhina L.Y.